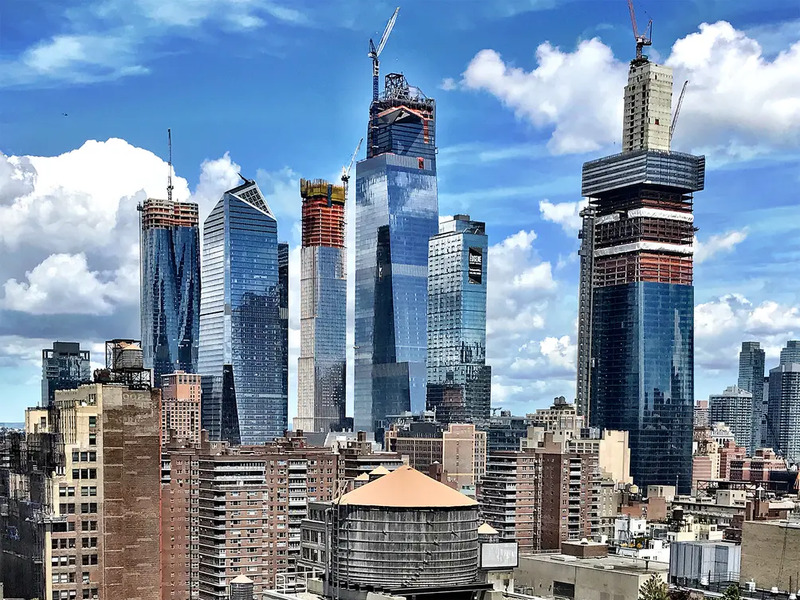 Among the myriad of towers going up on Manhattan's west side, one of the largest is One Manhattan West, a 67-floor, 2.1 million-square-foot commercial behemoth whose concrete core topped out some 900 feet above street level earlier this month. 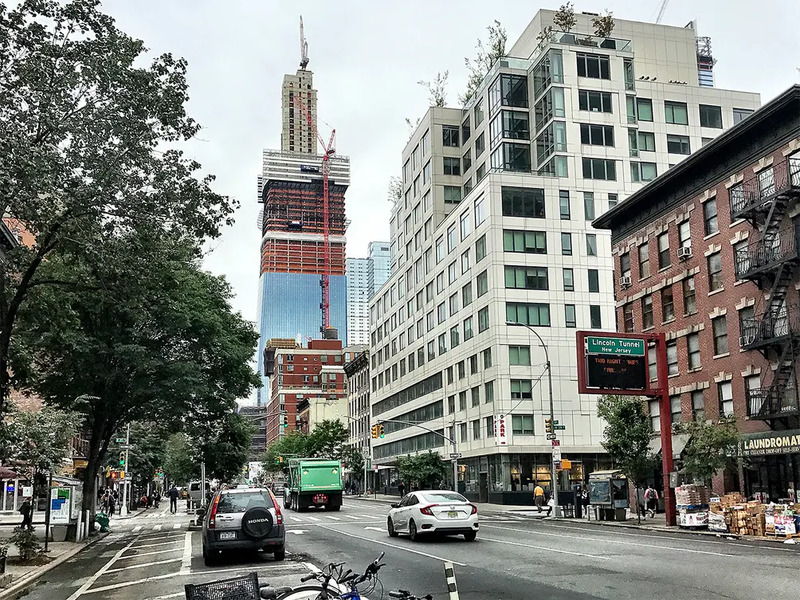 The supertall building developed by Brookfield Properties and designed by Skidmore Owings & Merrill (SOM), rises near the corner of West 33rd Street and Ninth Avenue and signed tenants include the National Hockey League, Ernst & Young, and Accenture. Earlier this month, the concrete core reached full-height with the surrounding steel frame following approximately 10 floors behind. We spoke to Peter Downes, Vice President of Navillus Contracting to learn more about this particular method of construction where the central core greatly precedes the surrounding skeleton and floor slabs. How is Navillus involved in One Manhattan West? Navillus is the concrete superstructure contractor responsible for the building of the concrete core for the new 2-msf office tower. This core is being built ahead of the structural steel skeleton and all the concrete floor slabs. Can you explain the concept/strategy of the core preceding the structural frame around it? What are the benefits and risks? Because you have the two major trades (steel and concrete) working with so much manpower and equipment on-site, it would be impossible to work side-by-side on the same floor. Teams would be constantly getting in each other’s way, creating safety issues and scheduling and logistical conflicts. Considering this, the two trades are kept as far apart and as self-sufficient as possible so not interfere with each other. The trick is to create a scenario where the two operations are working in tandem at the same pace but apart from each other. What is the purpose of the concrete core and what's in it? The concrete core is like the spine of the building and the steel beams for the floors are connected from the concrete core to the perimeter columns. This makes the structural skeleton of the building. I sometimes think of it like an artificial Christmas tree where you build the pole on the middle and then hang the branches off of it. Metal decks are then placed on the steel beams and concrete is placed on the deck to complete the floors. The core mainly houses the elevator banks and the stairwells. The concrete core provides additional protection in case of emergency and the occupants have to use the stairs to leave the building. We've seen this technique used for some of the buildings at the World Trade Center but why hasn't it been more commonplace in NYC? Generally speaking, it is common in office buildings that need higher floor-to-floor heights due to ductwork and raised floors. 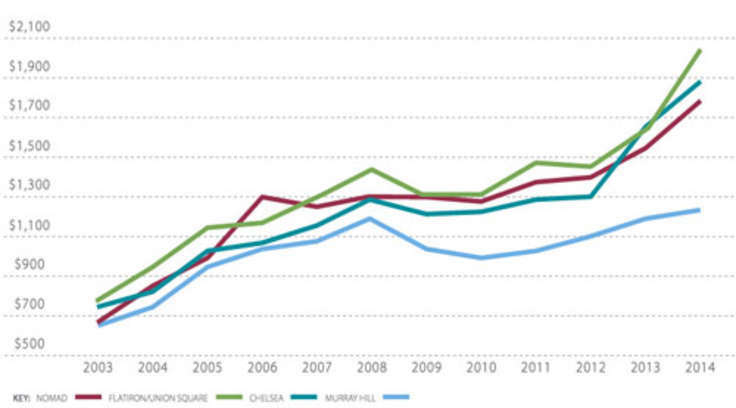 However, many office spaces in New York today require large open spaces so the fewer columns on a floor the better. Steel frame buildings are the most economical option to achieve this, as concrete frame buildings require more columns. How do you pump the concrete so high and how do construction workers get to pourings? We set up a concrete pump at ground level and run lines up through the building to the top. The line then connects to a placing boom at the top deck (floor) that we are working on. The placing boom is like a hose you attached to a hydraulic arm which we then can move around the core to place the concrete where required. We can also connect into the vertical pump riser at any floor which gives us the ability to pour concrete on any floor below us. We need this ability as the floor slabs are poured after the steel is in place. On Manhattan West, we had an inside personnel hoist that followed the concrete core. It was placed inside one of the elevator shafts. This would take the workers to within 5 floors where we were working. From there, staff would climb scaffolding stairs which are hung from the climbing form system we use to form and pour the core. How is the core connected to the rest of the structure? Do the two systems flex somewhat independently? Where we are placing the concrete on each floor, the structural steel contractor will give us steel plates to install in our core walls flush with the outside of the concrete. These plates are installed in specific locations so that the steel contractor can use to connect the steel beams to the core. Is there a limit of how much higher the core can rise above the rest of the frame? When the concrete goes ahead of the steel, there is not really a limit. The concrete operation is very self-sufficient and doesn’t rely on other trade to progress the work. These cores are so big and rigid they are almost like a building within itself. 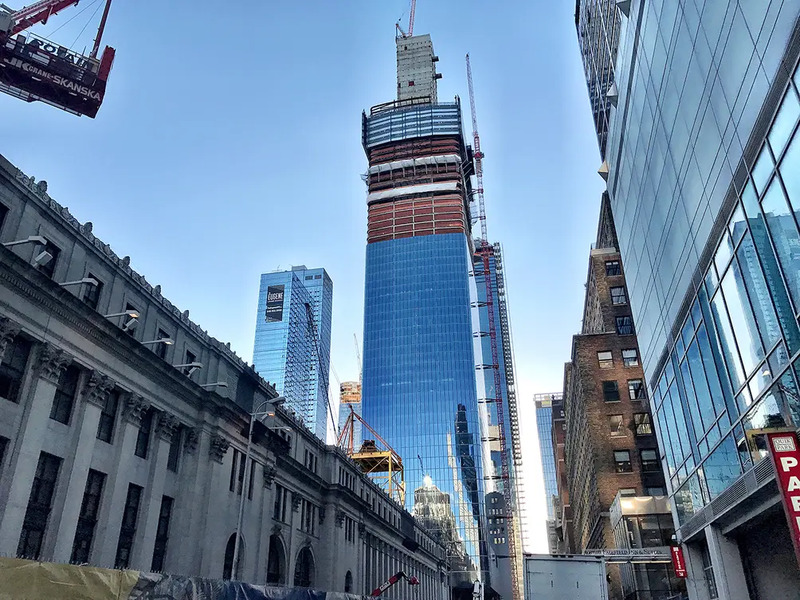 On other buildings where the steel structural frame is going ahead of the concrete core, such as One Vanderbilt where we are also working, the engineer may limit the number of floors that the steel can be ahead of the concrete for structural stability purposes. Founded in 1987, Navillus has been a leader in the city’s construction industry for thirty years. 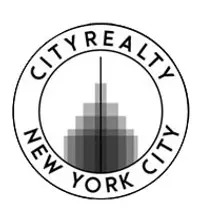 With recent projects including 252 East 57th Street, 100 East 53rd Street, and 400 Fifth Avenue, the company provides a wide-range of expertise ranging from project management in concrete and masonry construction and cost estimation. 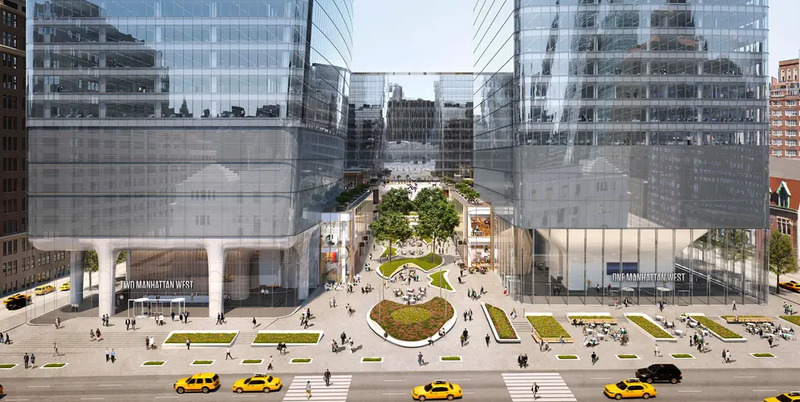 Developed by Brookfield Properties, Manhattan West rises largely above a rail cut servicing trains en route to Penn Station. 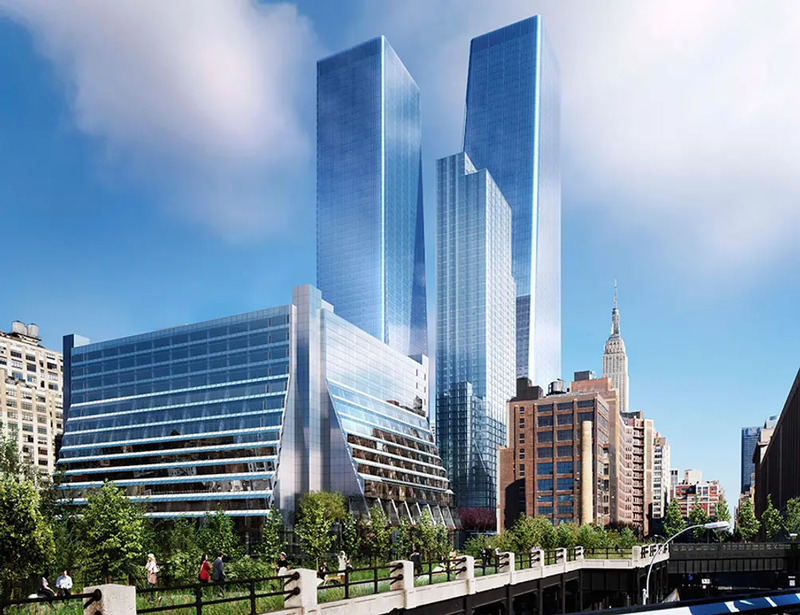 Ultimately, the 7 million-square-foot project will host two towering office buildings, One and Two Manhattan West; an already-open 62-story residential rental building called The Eugene, the rehab of two existing commercial buildings, and a ground-up 30-story mixed-use hotel-condo building, Four Manhattan West. 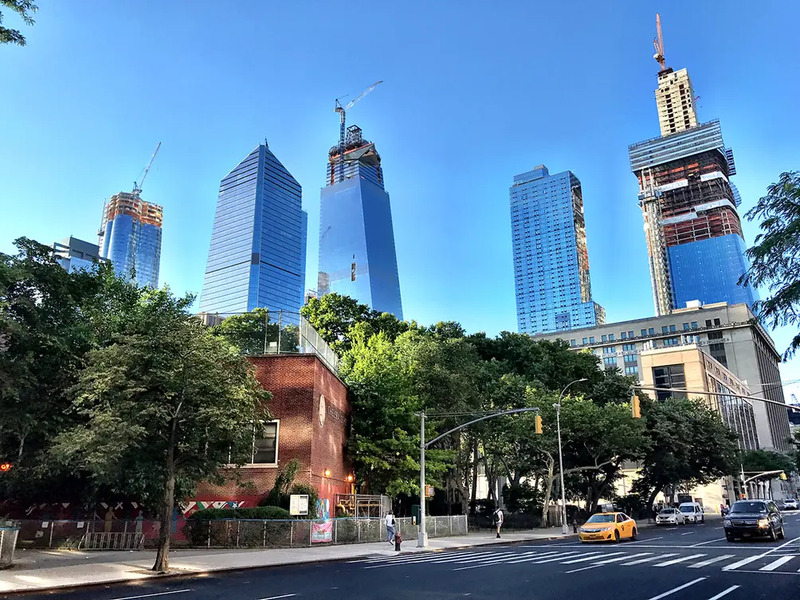 Navillus' two contracted towers, One Manhattan West and the Eugene, are among the firm's largest projects to date.